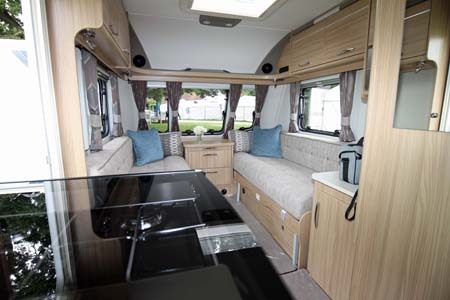 The Coachman Vision 570 is a new layout for the 2016 caravan season and with two separate living areas it promises to be ideal for larger families. 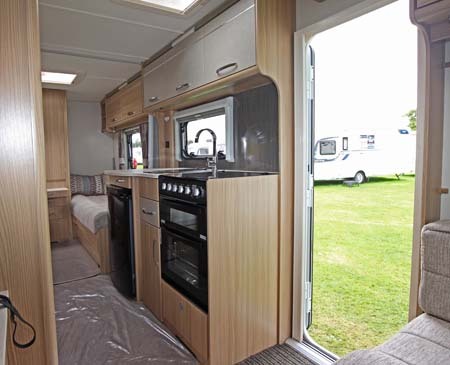 It’s a very flexible layout, nifty, with a centre shower room on the offside, a centre kitchen on the nearside, a multi-functional rear area and the traditional front living area. The rear has parallel seating with a bunk on the nearside. A wardrobe is on the back wall with drawers under it and a pullout table. There’re facilities for a television and one blown air duct for the Truma 6kw heating and hot water system. The kitchen features an 800w microwave, just about out of reach of a young child; a dual fuel hob with oven and grill; a contemporary chrome-look ceramic tap and a glossy splash back. The linen-look finish to the top lockers and a drawer are purely decorative and although there isn’t a large workspace, if you’re tidy, you’ll make it work. 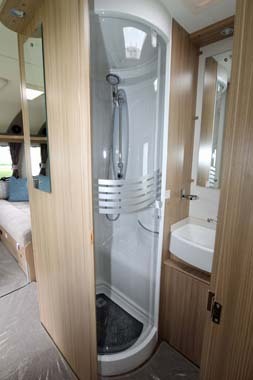 The shower room has a fully lined shower with a water-saving shower head and an LED light; a vanity basin with a chrome tap and a modicum of storage space. The single blown air duct will be welcome to take the chill off. 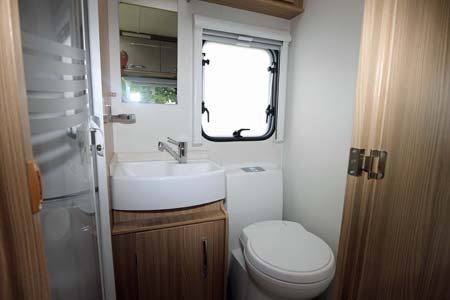 There are options for living and dining as it’s such an adaptable layout, but the front end has a chest of drawers and a pullout table, a television and mains electric socket on a pod above the triple windows, and another power point on the front of the seat, along with two blown air ducts. The interior furnishings are practical and restrained and commensurate with the layout, market position and price point. Verdict: This is a very versatile layout. It’s good for families, especially those with young children, with the juniors using the bunk beds. 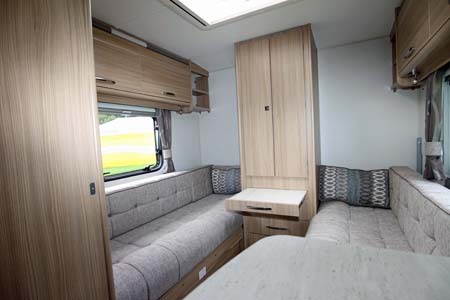 Although designed as a five berth, there is an option for a sixth berth in the rear on the nearside, whilst offering two spacious living areas during the daytime. Safety & security Features include an AL-KO AKS 3004 stabiliser and receiver for the optional AL-KO Secure Wheel lock, which is available as a dealer fit option; it adds 4kg to the weight and costs £255. If you were to add extra security features like factory fitted AL-KO ATC it would add 3kg to the weight and cost £345. Adding these optional security features may reflect favourably in the cost to insure this caravan. 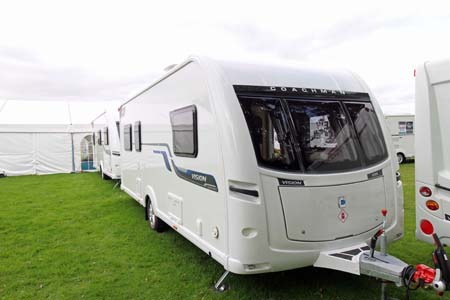 *Caravan insurance cost based on Coachman 570 caravan retailing at £18,595 fitted with hitchlock, optional Al-Ko secure wheel lock and optional ATC trailer stability control system. Kept on drive at HX4 0BE. Caravanners over 30 years old, claim free for 3 years and a member of a caravanning club. £100 excess. 180 days European cover and up to £75 per day for up to 15 days emergency accommodation cover included. Legal expenses cover, extended European cover and other emergency accommodation expenses cover options are available at extra cost. Quote includes 10% online discount and 9.5% Insurance Premium Tax and is correct as of 4.4.16.